Initially settling in shrimp camps on the Oakland estuary in the 1850s, Chinese arrived en masse to help build the Transcontinental Railroad during the 1860s, and later to build Temescal and Lake Chabot Dams. Local exclusion laws forced the Chinese to resettle to the area of 8th and Webster Streets in the 1870s. After the 1906 Earthquake and Fire destroyed most of San Francisco’s Chinatown, over 4,000 Chinese survivors found refuge in Oakland. This amazing atmospheric view from our private collection transports me back to another era - it almost looks like a scene out of Deadwood, yet it is real. 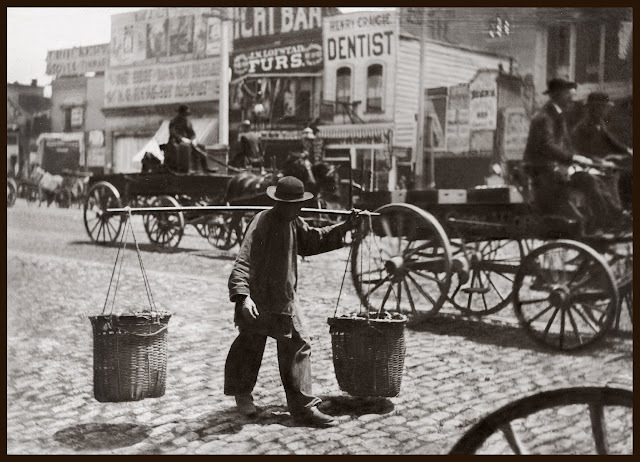 Can you hear the wagons wheel percussion as they traverse the cobblestone street of the booming young City by the Bay? 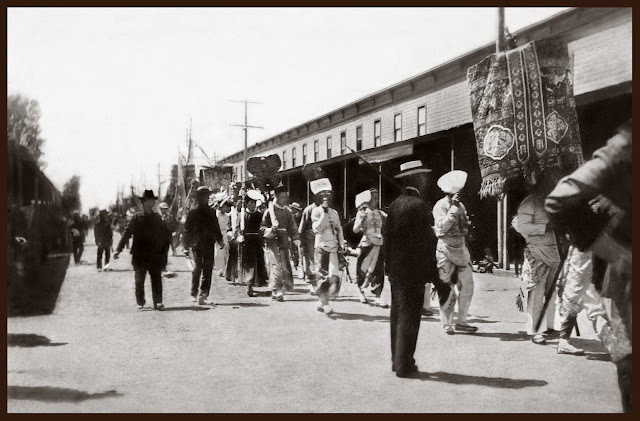 Gold Rush lured many Chinese to California who later migrated to urban areas in the 1860’s and ‘70’s. They became a dominant work force in industries of canning, cigars, woolen mills, shoes, and sewing, and in restaurants and laundries. They were such hard workers they were perceived as a labor threat which led to many conflicts and regretul incidents prejudice, violence and injustice. For the Chinese women it was worse - often brought here in slavery or under a variety of false pretenses, foot-binding and prostitution were common, suffering by Chinese woman was the norm, as immigration problems, drugs, corruption intertwined with the times and the 'powers that be' made life difficult to say the best.